Fredrik started his trip at 0400. He hooked up with Gunnhild 30 minutes later. The first picture has been uploaded. After traveling for more than 20 hours, we have finally arrived in Lima, Peru. 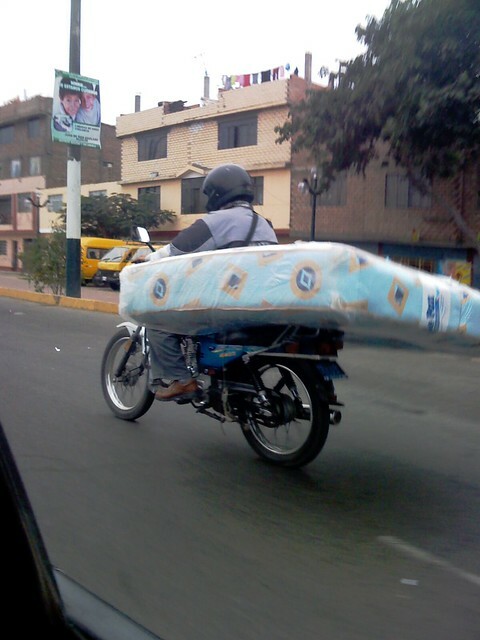 One of the first impressions of Peru was this guy on a motorcycle. We are now going to check out a folklore festival in a park just 3 blocks from our hotel. 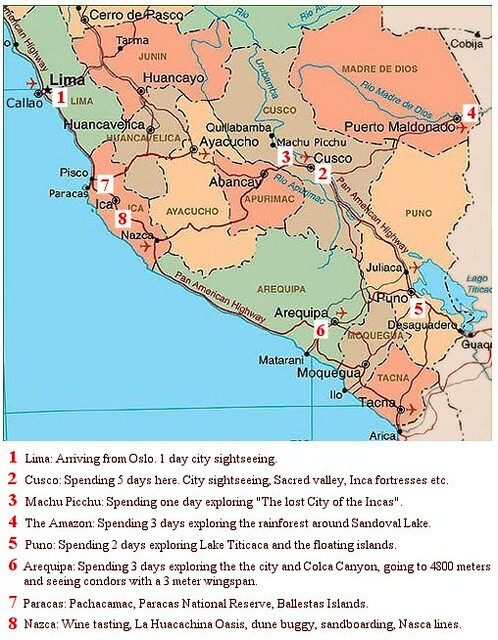 All the guidebooks claim that Lima is a dangerous and unwelcoming city. We have experienced the oposite. The driver that picked us up at the airport was very friendly, and in spite of very limited English he were able to explain everything we saw on the way. We stayed in a small and very cozy hotel, central but quiet and peaceful. 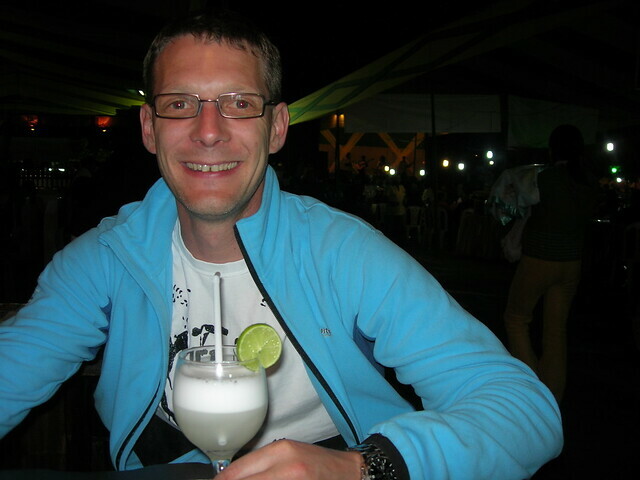 The first evening we went to a market/folklore festival, tasted the peruvian drink Pisco Sour and went to bed early. Yesterday we woke up early and went city sightseeing. We walked to the main square, and later took a taxi to Miraflores. We walked along the beach for a while and stopped for beer and food on the way. In a few minutes our nice driver is taking us to the airport and we are headed for Cuzco. We have had a great time so far, and are really looking forward to the rest of the trip. How are things back home? Use our guestbook! We arrived in the hotel in Cuzco around 1 pm and got a fantastic welcome. We were served a cup of coca tea (for the altitude) in the lounge while the staff handled our luggage and all paperwork. We booked the tours for the next few days and checked out a small museum before it was time for some dinner. In spite of the experience yesterday we decided to try another local speciality – Alpaca with local herbs and fruits and a local wine. Fantastic! After dinner there was a huge parade in the main street. 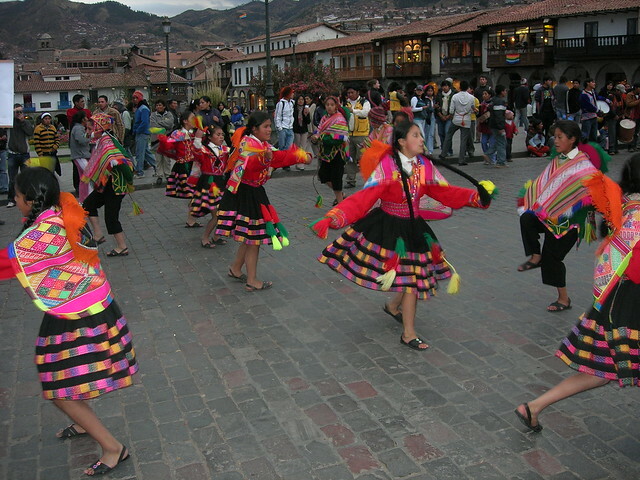 Local children in local costumes dancing in the street. Almost like 17th of May in Norway. At the moment we are relaxing in the hotel, trying to adjust to the altitude. Looking forward to some city sightseeing tomorrow. Yesterday we all went on guided tour to the Sacred Valley of the Incas. 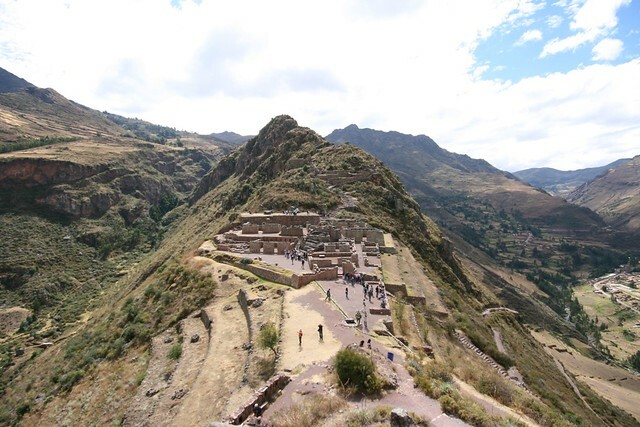 After a short photo / market stop in the mountains we stopped at the Pisac ruins. It was quite a hard and steep walk to the top, but it was definately worth it. Seven of us also walked parts of the Inka Trail, a more challenging route, back to the bus. We had a huge lunch buffet with a lot of local specialities in Urubamba, before we continued to the famous ruins in Ollantaytambo. This spectacular fortress was one of the few places where the Spanish conquistadors lost a major battle. 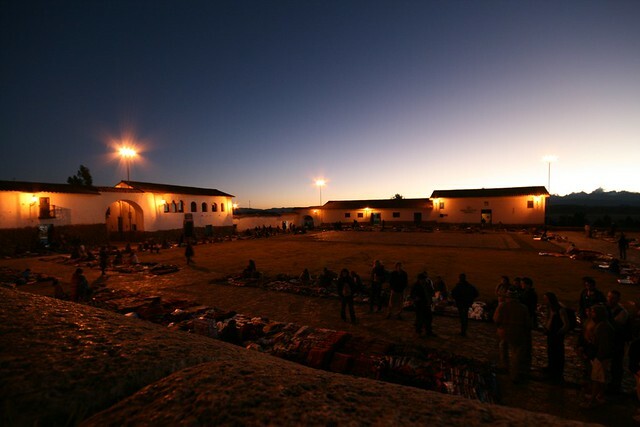 Our last stop of the day was Chinchero, known to the Incas as the birthplace of the rainbow. We visited the colonial church, some Inca ruins and the local market. Right now we are sitting in a car on our way to Moray. The views are spectacular! Finally we found the time (and the hardware) to upload some pictures to the web page. We have also updated a few of the stories with pictures. Yesterday we got up at 0430 in order to get to Machu Picchu before sunrise. We started with a 2.5 hours guided tour where we got a lot of interesting information about the city and all the myths and legends connected to it. Fascinating! After a short lunch we decided to try to be one of the lucky 400 to climb Wayna Picchu. We were a bit late, but just made it. We were number 399 and 400! Wayna Picchu is the mountain you see on pretty much every picture of Machu Picchu. The climb was steep, difficult and sometimes a bit scary, but when we reached the top after approximately one hour it was all worth it! 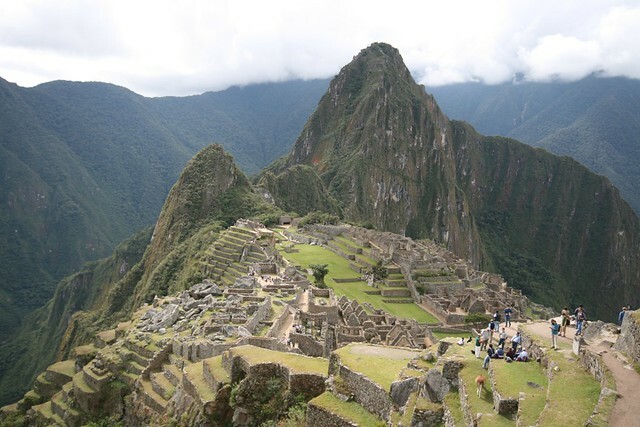 The views of Machu Picchu, the Inca trail and the surrounding area was unbelievable! This is also the only place where you can see the condor architecture of Machu Picchu. We have uploaded a couple of mobile pictures. The rest will come as soon as we get back to the civilization. Now we are on our way to the Amazon. After a short flight to hot and humid Puerto Maldonado we were picked up by our guide Leon. We stopped at an animal conservation centre before we started our journey by boat down the river Madre de Dios. On the way we saw lots of colorful birds and a white cayman (peruvian alligator). On the boat we were served an ecological lunch served in large leaves. After about 1 hour boat ride we left the river and walked 3 km through the rainforest to Lake Sandoval where we spotted a sloth (dovendyr), a very rare anteater, lizards, birds and lots of butterflies. Sandoval Lake Lodge was located on the other side of the lake and we were paddled across in traditional canoes. The lodge itself was beautifully integrated with the surrounding nature and could hardly be seen from the lake. At the same time it was quite luxurious and had a fantastic view. We stayed two nights at the lodge, met a lot of great people and went on several walks and canoe trips. The most facinating one was probably the night hike where we used flash lights to spot small and large spiders, tree frogs and other small animals coming out at night. The garden of the lodge was also very interesting. 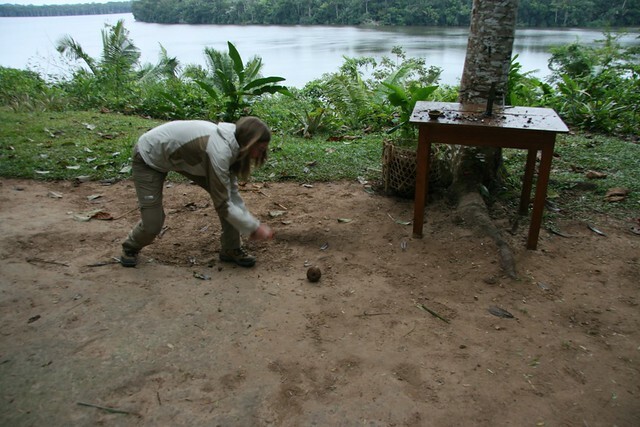 Two large tarantellas lived just outside our room, and in the garden we also found a lot of rainforest plants. Some of them were used for food and some for medicine, and we were able to both taste and smell them. Most people took the same route back to Madre de Dios, but our guide asked us if we wanted to walk through the rainforest instead of going in canoes. It was a beautiful walk and we saw plenty of monkeys, parrots and macaws. We had a breakfast picnic and caught up with the rest of the group by the river. 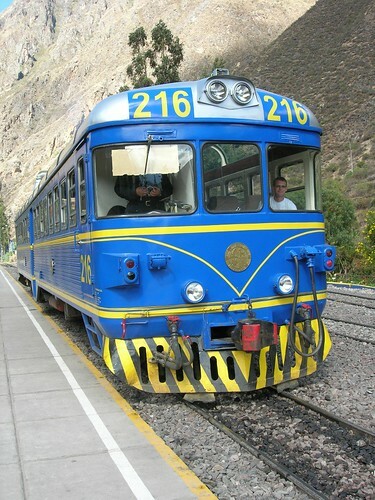 Inka Express is a guided tour from Cuzco to Puno. 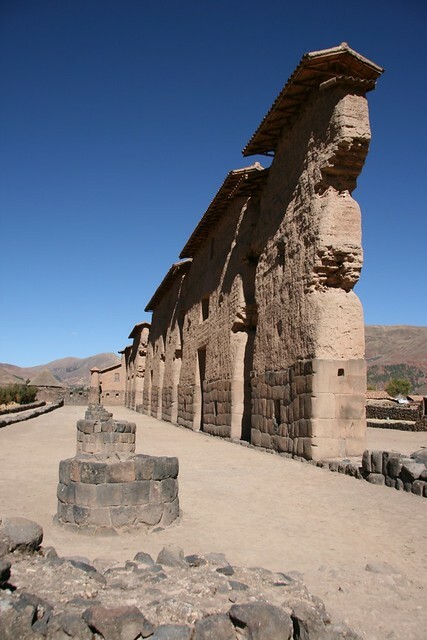 We stopped at Andahuaylillas – The Sixtine Chapel of America, Raqchi – Temple of Wiracocha God, La Raya pass – 4335 meters above sea level and Pukara. 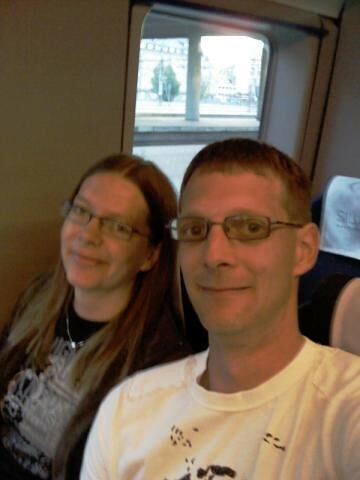 In the evening we met up with the others that came by train and had a relaxing evening in the hotel. Laura organized a private tour of Lake Titicaca for the next day. Our hotel was located on a small private island and we were picked up at the private port. Our first stop was the floating islands of the Uros (Uros Islands). The islands are built using totora reeds that grow in the shallow parts of Lake Titicaca. The reeds are also used to build the houses, the boats and to make crafts. Parts of the reeds are also edible, and they normally eat approximately 15 a day. New layers of totora reeds are added on top of the islands twice a week as they rot from the bottom. Traditionally the Uros make a living from fishing and trade this for corn and potatoes from the mainland. For several of the islands tourism is now the main income. We bought some crafts, tasted the reeds, tried on some traditional Uros clothes and were paddled in a reed boat to another island. When leaving the Uros the ladies were singing, first some local songs, then some 80’s hits and in the end they shouted “Hasta La Vista Baby!”. Charming, but very touristic. This small island 35 km from Puno has been inhabited for thousands of years and the people maintain a strong sense of group identity. 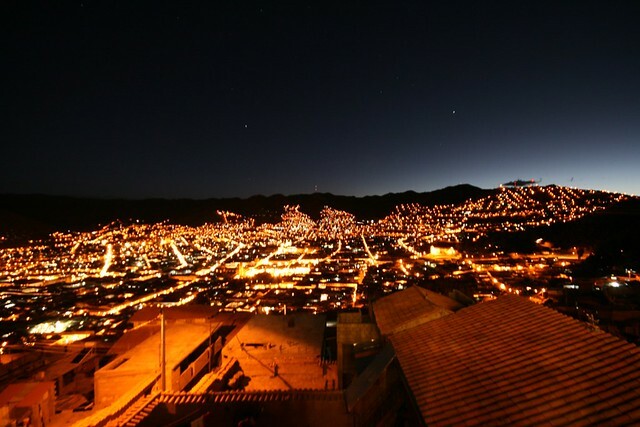 Taquile felt like its own little world, completely detached from the modern world. The island was completely covered by agricultural terraces, and the scenery was stunning. Red soil, blue lake and Bolivia’s snowy Cordillera Real in the horizon. Traditions are very important to the society. The men wear tightly knitted hats in colours showing if they are married or not. They take pride in knitting them themselves, and some say that a potential father-in-law would fill the hat with water, and if leaking the man would be a lazy husband. Single women wear colorful skirts while the married women wear black. They weave colorful and very detailed waistbands for their husbands which are used to protect their backs as there are no cars or donkeys on the island, and everything is carried around. Their handicrafts are among the best-made in Peru, and are sold at fixed prices in the cooperative store on the main plaza. After a tight schedule we decided to take it slow for a couple of days. We walked around the island of the hotel to see the alpacas living there. At 3 pm we took the first class bus to Arequipa. It was a bit delayed, but with huge recliner seats that was no problem. The next day we started with breakfast at a terrace at the main plaza with a great view of the city’s grand colonial buildings and the surrounding volcanoes. We walked around the city with Jorgen and Kristina, visited a local market and the Monasterio de Santa Catalina. The monasterio is guarded by high walls. 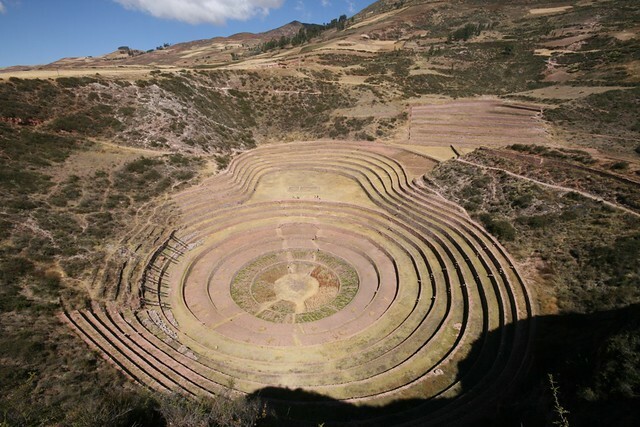 It has both colonial and andean architecture and is almost a citadel within the city. In the evening we had a briefing with the Colca Canyon tour organizer, and then went for a couple of beers in a so called Irish Pub. At 7.30 am we were picked up in the hotel and started our journey towards Colca Canyon in a private van. We had several stops on the way to see lamas, alpacas, vicuñas, viscachas, different birds and of course the spectacular landscape. At 1 pm we stopped at the highest point of the trip, approximately 4900 meters. We had a buffet lunch in Chivay and afterwards we went for a swim and a beer in the hot springs. 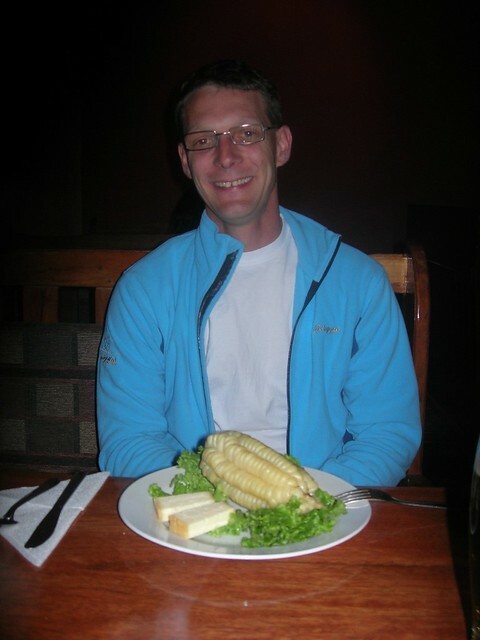 We arrived in our hotel in Cabanaconde around 6 pm and after a beer and updating our webpage we went for dinner in a rustic, local restaurant. There were no electricity, only candles and a fireplace. Great food, great wine, great atmosphere and lots of smoke and sparks from the fireplace. We got up at 6 am to eat breakfast before going to Cruz del Cóndor. We went for a short and freezing cold walk along the edge of the canyon before the first condors appeared around 8.30 am. At one time we could see ten of them gliding effortlessly on the thermal air currents rising from the canyon, some of them really close. With a wingspan of up to four meters they were really impressive. Instead of going back to Arequipa the same way as most tours do, we drove through Cabanaconde and continued on a narrow dirt road over the mountains. At noon we had a picnic lunch in the park of the small village Huambo. We continued over the mountains, through the valley of volcanoes and went up to more than 4200 meters. On the way the landscape and the colours changed dramatically, and we had great views towards several snowcapped mountains, more than 6000 meters high. The road down from the mountain was not as interesting. It was very, very bumpy and the view was mostly sand and cactuses for hours. We arrived in Arequipa around 6 pm, and after a long, hot shower we went for a farewell dinner at a recommended restaurant. 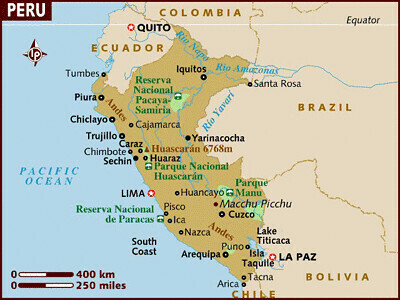 Tuesday we arrived at Lima Airport 6.30 pm and were picked up by a driver from our hotel. We went for dinner in a very charming Italian restaurant/deli/cheese shop/bakery. We also bought some breakfast for the next mornnig here. When we got back to the hotel our guide from http://www.peruadventurestours.com had left us a message saying that we would leave at 8 am instead of 6 am. Great! We expected to be part of a bigger group, but were picked up by the guide and a driver and will be on a private tour most of the time. Our first stop on the way down the coast was Pachacamac, an extensive archaeological complex used as a ceremonial center since 800 BC. We followed the Pan-American Highway to Paracas. After checking in to the hotel we went to the Paracas National Reserve where we started by visiting a small museum/information centre. We had lunch (seafood of course) in the tiny fishing village of Lagunillas where we also could see a lot of birds. We drove around the desert to visit several lookouts to see sea-lions, more birds and various rock formations. In the evening we walked around the very quiet city of Paracas and had dinner almost by ourselves in a nice, little restaurant. We were served breakfast in the room in Paracas before heading to the harbour and meeting our group for the boat ride to Ballestas Islands. We were approximately 30 people on the boat, and our great guide Leo Reyes made sure we got good seats. On the way out we saw a large group of dolphins, lots of large peruvian pelicans and other birds. We also got plenty of wind and salt water in our hair. Safly back in Paracas we continued our private tour to Ica where we went to a small bodega (winery). We had a very interesting tour of the winery which still used old techniques like pressing the grapes by foot. Afterwards we got to taste different wines, piscos and marmelades, and ended up doing a little shopping. The next stop was Huacachina, a small oasis in the desert. We attacked the sand dunes in a small dune buggy and stopped a couple of times to sandboard down the dunes. Fun! We had lunch and a walk around the oasis before we hurried towards Nasca to visit the Palpa and Nasca lines watch towers before sunset. We stayed at Hotel Majoro, previously a hacienda founded by the head chief of the valley. Most of the evening were used to try to get rid of all the sand in our clothes, hair, ears etc. We were picked up by our guide Leo at 6.30 am. It was a bit foggy so we went to visit the Cantallo aquaducts, which are still in working order and essential to irrigate the surrounding fields. We also had time to see how the local miners are working before the sky cleared up and we went to the airport. We had a 35 minute flight over the Nasca lines in a small Cessna (3 seats + pilot). We heard that this flight could be a rough experience, but our pilot was excellent and we had a smooth flight. Our guide took us for breakfast in a very local restaurant, we said goodbye an had some time to walk around Nasca city centre and relax in the sun before taking the bus back to Lima at 2.30 pm. We had the front seats on the upper deck, the so-called panorama seats. We’re very pleased with the tour from http://www.peruadventurestours.com and both our driver and our guide (Leo Reyes) were great!! We got to see a lot more than was originally included in the tour, and the knowledge of the guide was impressive. We arrived in Lima quite late and went straight to the hotel. Our bags are packed and we have a few hours in Lima before we are going home. We will be in Norway tomorrow (Sunday) around 4.30 pm.